Edmund Spenser (c. 1552-1599) was a renowned poet in the late Tudor era. He combined his literary activities with a government career in Ireland. Spenser probably arrived in Ireland in the late 1570s. He acquired land as a settler in south Leinster and Munster and from 1589 was an active promoter of the Munster Plantation. Under the plantation scheme he received a royal grant of 3,000 acres at Kilcolman in County Cork. His tenure of some of those lands was challenged successfully in the courts by the Roche family, barons of Fermoy. His house at Kilcolman was burned in 1598 at the height of the Nine Years War (1594-1603) and he and his family left Ireland. Spenser was among those Tudor administrators who advocated the reform of Ireland. His View of the present state of Ireland was written c. 1596. It circulated widely in manuscript before being printed for the first time in 1633. It continues to be consulted for the insights it provides into the political attitudes of New English settlers in early modern Ireland. A less-studied dimension of Edmund Spenser’s Ireland is the Gaelic literary culture that was prevalent in his day. Much of the work of the Gaelic learned class from this era – poets, historians, lawyers and others – is still preserved in Irish language manuscripts. This exhibition draws attention to some of the literary and scribal activity of late sixteenth-century Irish poets, historians and other members of the professional learned class. 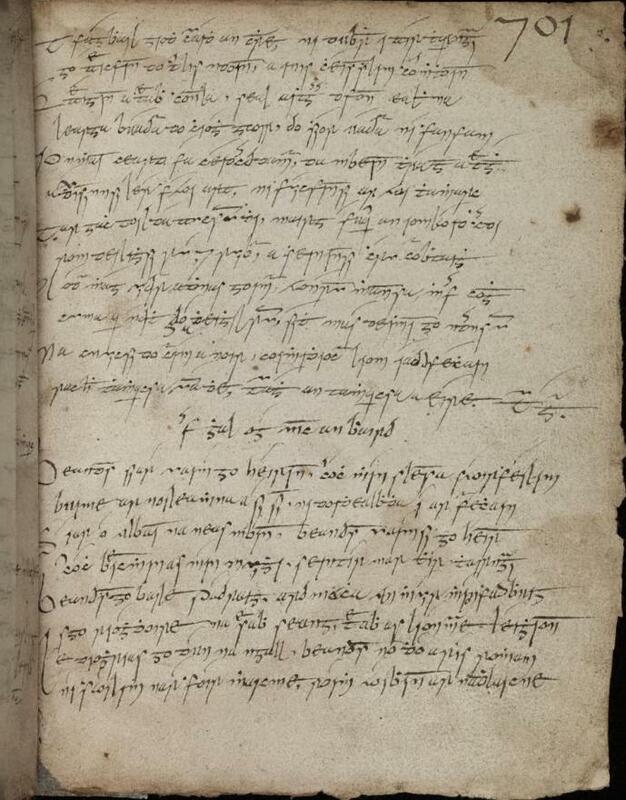 The work of bardic poets is represented by two manuscript compilations, RIA, MS A iv 3 and RIA, MS 23F 16, which include the work of Fearghal Óg Mac an Bhaird (d. c. 1618) and Giolla Bhridhe Ó hEodhasa (d.1614). 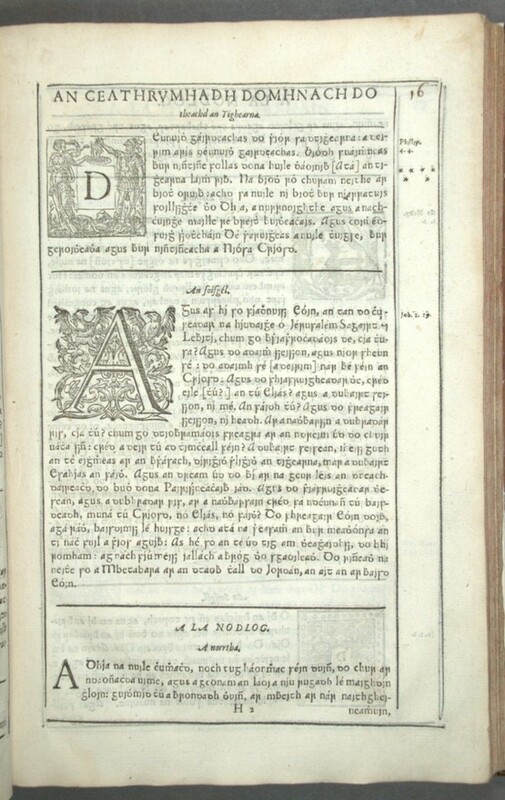 The printing of Spenser’s View prompted an immediate reaction from an Irish historian, Geoffrey Keating (d. 1644), who took issue with the negative representations of the Irish people in the writings of Edmund Spenser, Meredith Hanmer, William Camden, Richard Stanihurst and others. Keating’s work, in Irish and in English translation, is displayed here, alongside the renowned Annals of the Four Masters. Also on view are some of the earliest printed works issued in the Irish-language which were the work of professional Gaelic poets and translators. 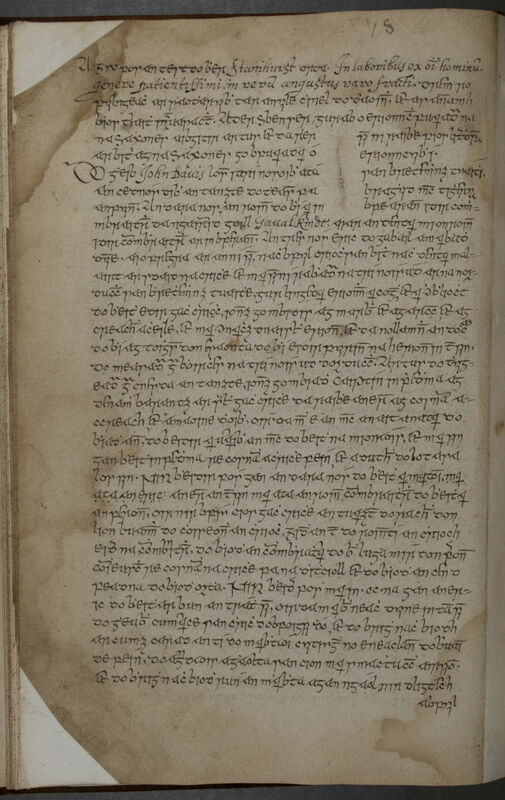 This unique manuscript of the Annals of Connacht records episodes in the history of Ireland from 1224 to 1544, with one later entry for 1562. It was written in Irish in the mid-sixteenth century. The writing, on vellum, is in double columns without decorative capitals. 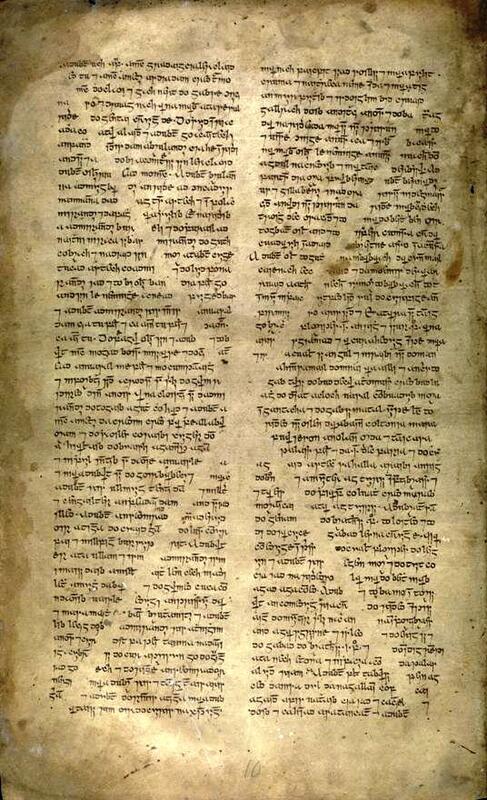 The forenames of two of the scribes were Paitín and Seán R(iabha)ch, and they were probably members of the learned family of Ó Duibhgeannáin. These annals are thought to derive from an older source that was the work of the learned family of Ó Maoil Chonaire, hereditary historians to the O’Connors of Connacht. The first entry is on Cathal Crobderg O’Conor, who died in 1224, and there is a special emphasis throughout on the history of the O’Conors. Incidental astronomical data is also included. 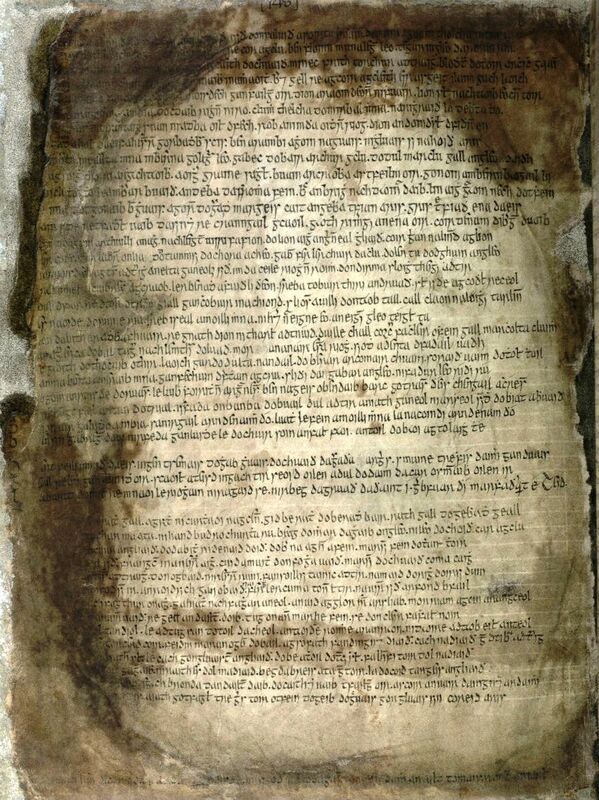 The early sixteenth-century manuscript now known as Leabhar Chlainne Suibhne is in three sections. The first part, folios 1 – 65, was written by Ciothruadh Mág Fhionngoill of Tory Island, County Donegal, in 1513-14, for Máire Ní Mháille. This section is now usually known as the ‘Book of piety’. It comprises a variety of religious texts including saints’ lives, moral tales and legends, as well as some catechetical and liturgical material. It was commissioned by Máire Ní Mháille, wife of Ruaidhrí Mac Suibhne Fanad. 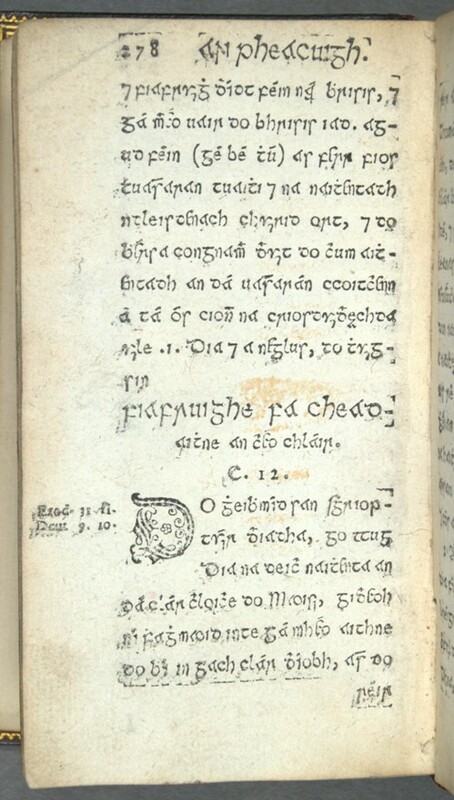 The second part of Leabhar Chlainne Suibhne, folios 66 - 72, was written by Tadhg Mac Fithil, 1532-44, and deals with the history of the Mac Sweeneys of Fanad. This family history was published in Irish with a parallel English translation by Paul Walsh (1920). The last part, folios 73 – 81, contains approximately 24 family poems by various authors and scribes, dedicated to three different chiefs of the Mac Sweeneys of Fanad. Irish language editions of these Mac Sweeney of Fanad poems are among those recently published in A bardic miscellany (2010). The present half-vellum, gilt-tooled binding dates from c. 1852. Tiomna Nuadh ar dtighearna agus ar slanaightheora Iosa Criosd, ar na tarruing gu firinneach as Gréigis gu Gaoidheilg / re hUilliam O Domhnuill [William Daniel] (Dublin, 1602). 1st edition. The translation of the New Testament into Irish was considered an important initiative in the Reformation in Ireland. Gaelic translators were employed on the government-sponsored project in the late sixteenth century. This was the work for which the first Irish type, paid for by Elizabeth I, was commissioned. It is still known as the ‘Queen Elizabeth’ Irish type. This pioneering printing task was begun by William Kearney in the last decade of the sixteenth century and was completed by John Francton in 1602-3. Leabhar na nUrnaightheadh gComhchoidchiond agus mheinisdraldachda na Sacrameinteadh [Book of Common Prayer] Dublin, printed by John Francton (Dublin, 1608). 1st edition. The Book of Common Prayer was first printed in Irish in 1608, by John Francton, the King’s printer in Ireland. 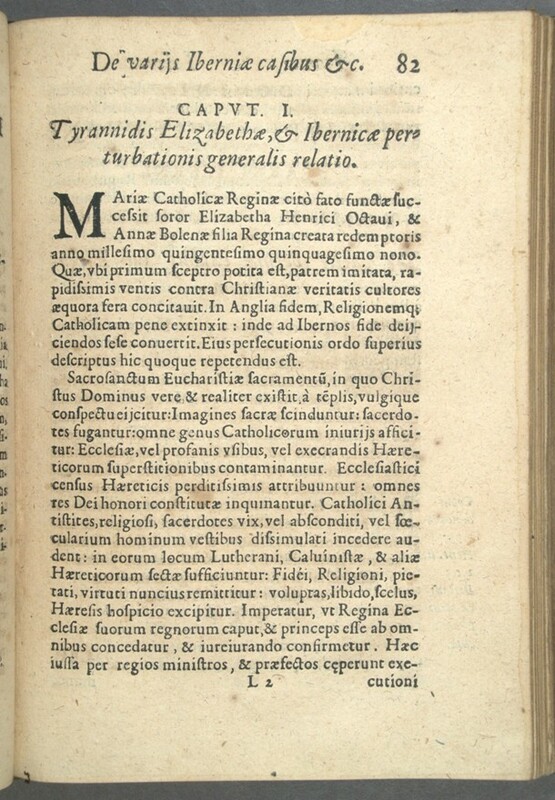 Francton used the same ‘Queen Elizabeth’ Irish type that had been used for the Irish translation of the New Testament. The Irish translation of the Book of Common Prayer was made by William Daniel (Uilliam Ó Domhnuill), who had also worked on the translation of the New Testament. Pp 76v-77 show the readings for 17 March, St Patrick’s day. This 1608 copy was conserved and rebound in 2004 by Benjamin Van de Wetering (Ox Bindery). Catholic printing was forbidden by law in Ireland in the seventeenth century. Irish Franciscan authors at Louvain in the Spanish Netherlands wrote and published catechetical and devotional books in Irish for use by Irish Catholics. They commissioned their own font which was very closely modelled on the Gaelic script used by contemporary scribes. 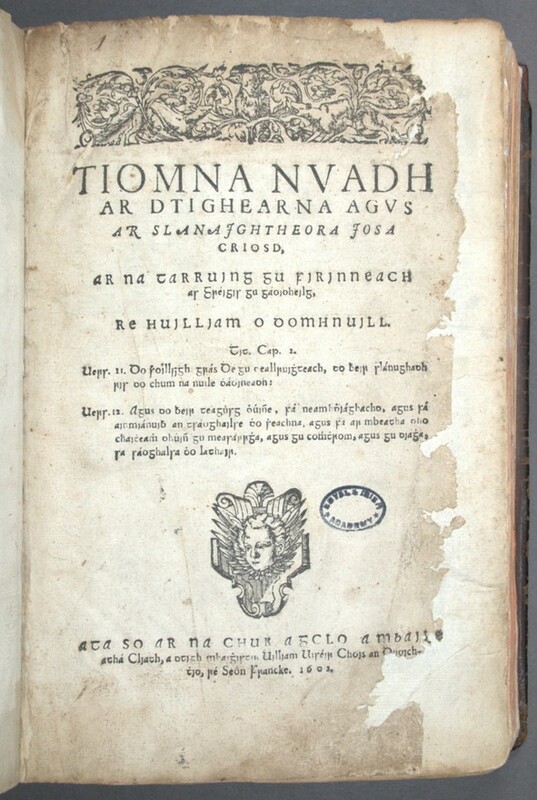 Among the books published at Louvain, using the ‘Louvain A type’, was this treatise on the sacrament of Penance by Aodh Mac Aingil (Hugh McCaughwell), OFM, archbishop of Armagh. Irish Catholic clergy in continental colleges in the early seventeenth century actively promoted a positive image of the ‘island of saints and scholars’ through the publication of saints’ lives. Rev. 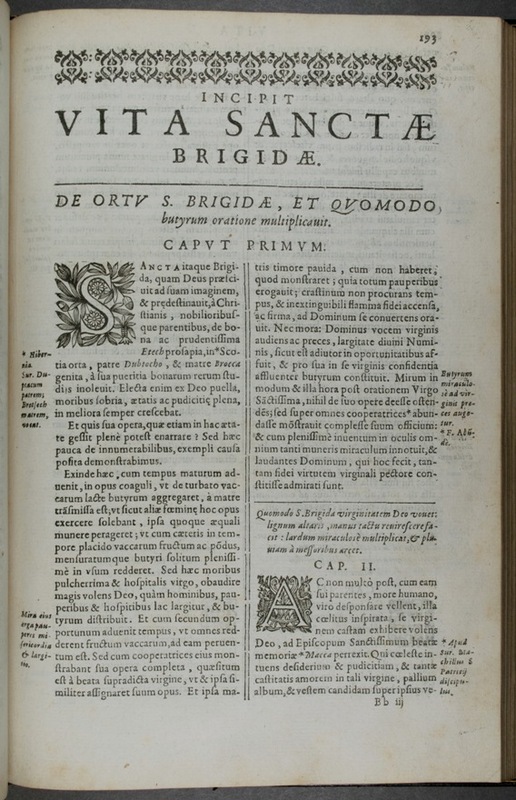 Thomas Messingham, an Old English priest from County Meath, published lives of Ireland’s three patron saints, Patrick, Brigit and Colum Cille, in Latin for non-Irish readers in 1624. He prefaced his work with a defence of Ireland’s reputation that found resonances in the work of Geoffrey Keating a decade later. 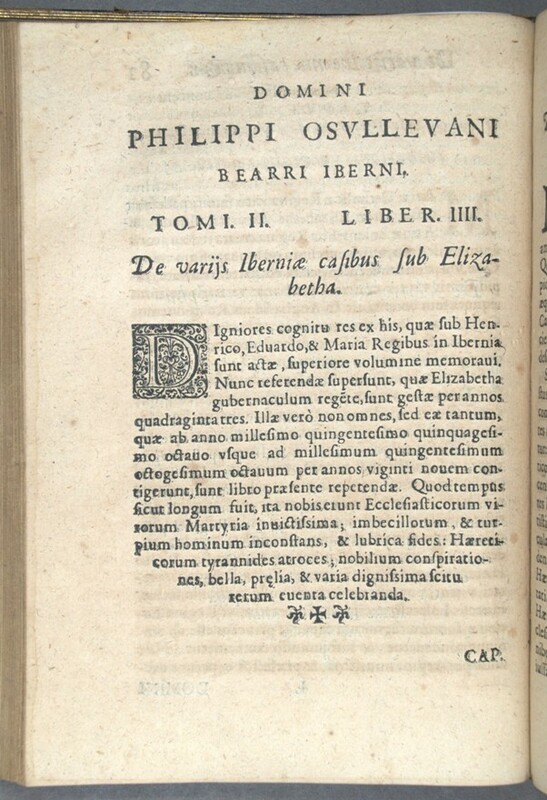 His work was also a forerunner of a more ambitious programme of publishing lives of Irish saints promoted by the Irish Franciscans at Louvain in the early seventeenth century. Philip O'Sullivan Beare's Catholic history of Ireland was deliberately polemical. It promoted the idea of Catholic Ireland as an island of saints and scholars. It outlined a history of persecution by ‘heretics’, and the ‘tyrrany’ of the Elizabethan era. The book promoted the idea of a Spanish conquest of Ireland and was dedicated to Philip IV of Spain. O'Sullivan drew on the Irish origin legend, Leabhar Gabhála Éireann (Book of the Invasions of Ireland), as a means of affirming longstanding links between Ireland and Spain. Peter Lombard’s polemical Catholic history of Ireland was published posthumously in 1632. It combined an analysis of late sixteenth-century Irish politics and geography with an account of Irish history since the twelfth century. He was particularly concerned to promote the reputation of Hugh O’Neill, earl of Tyrone (d.1616), but Lombard’s focus extended well beyond Ireland. He argued that Ireland could set an example for the re-catholicisation of England and northern Europe. 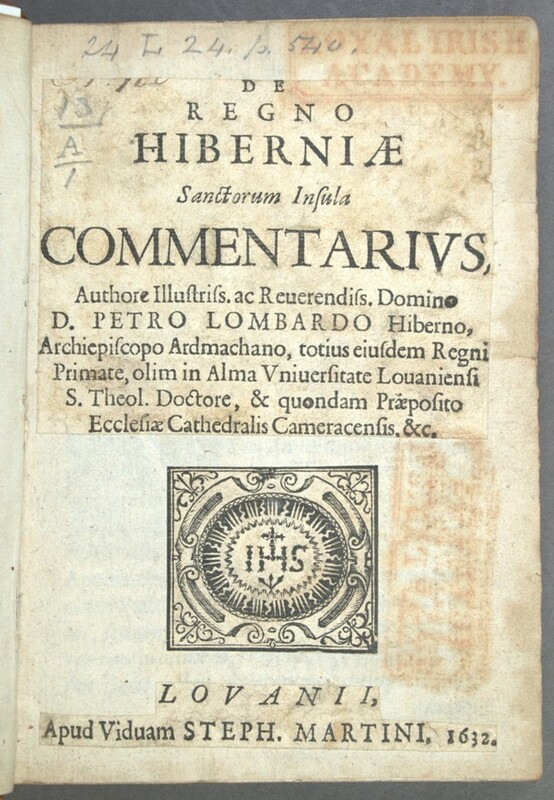 Writing for continental readers and advocating Spanish intervention in Irish politics, Peter Lombard, archbishop of Armagh, chose Latin as the language of his book. 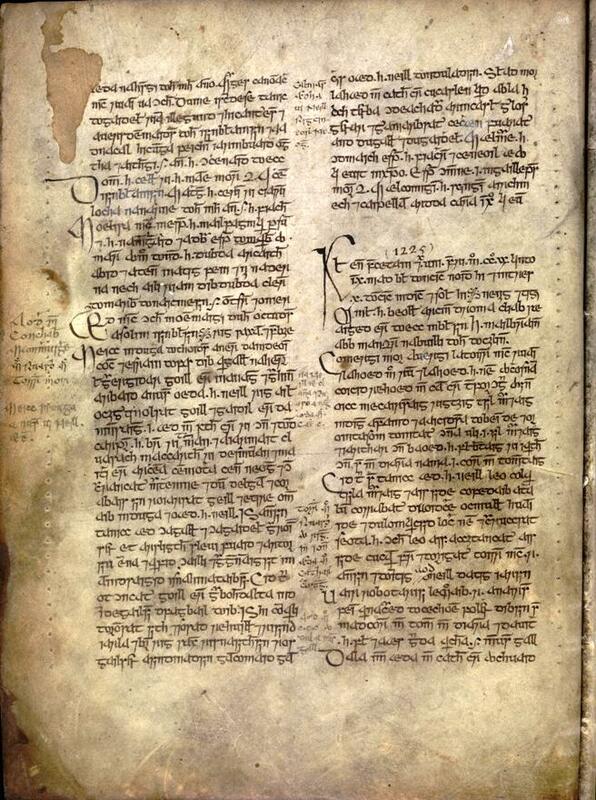 The late-medieval manuscript miscellany from north Cork, now known as the Book of Fermoy, was produced under the patronage of the Roche family. Its varied contents include a version of the Leabhar Gabhála (Book of Invasions) and the poem-book of Gerald FitzGerald, 3rd earl of Desmond, comprising some 30 poems composed in the late fourteenth century. The core of the manuscript comprises bardic poetry addressed to members of the Roche family in the fifteenth century, along with a selection of prose tales, saints’ lives and biblical history. Further significant additions were made in the mid-sixteenth century, extending the family ‘duanaire’ (poem-book) by incorporating poems on later members of the Roche family in the barony of Fermoy. Among the features of this miscellany is the involvement of women as literary patrons and as the subjects of poems. The manuscript preserves a heritage of family poems from Munster extending over 300 years. This collection of poems has been described as ‘heraldry in words and metre’. This important collection of medieval tales was compiled in 1575 in the house of Seán Ó Maoil Chonaire at Baile in Chuimine (Ballycumin), County Roscommon. The contents include sagas, gnomic tracts and religious poems. It is considered by many to be of particular significance as a source for the contents of the lost medieval manuscript known to scholars as ‘Cín Dromma Snechta’. Some of the tales preserved here belong to the period of the oldest Irish literature to have come down to us. The main scribes were Aodh and Dubhthach [Ó Maoil Chonaire], with occasional additions by Torna [Ó Maoil Chonaire]. The manuscripts was purchased in 1851 by the Academy for £139 from the collection of Sir William Betham. Most of its contents have been published, for the most part edited by Kuno Meyer. Texts on display (p. 20) include a religious poem, ‘Deus meus adiu[v]a me’, in alternate Latin and Irish, and ‘M’oenaran im aireglan’, 14 qq, known as ‘the hermit’s song’. Page 21 contains the opening of Tochmarc Emire, a tale from the Ulster Cycle, telling the story of Cuchulainn’s wooing of Emer. A photographic reproduction, with a descriptive introduction by R.I. Best, was published in 1954. 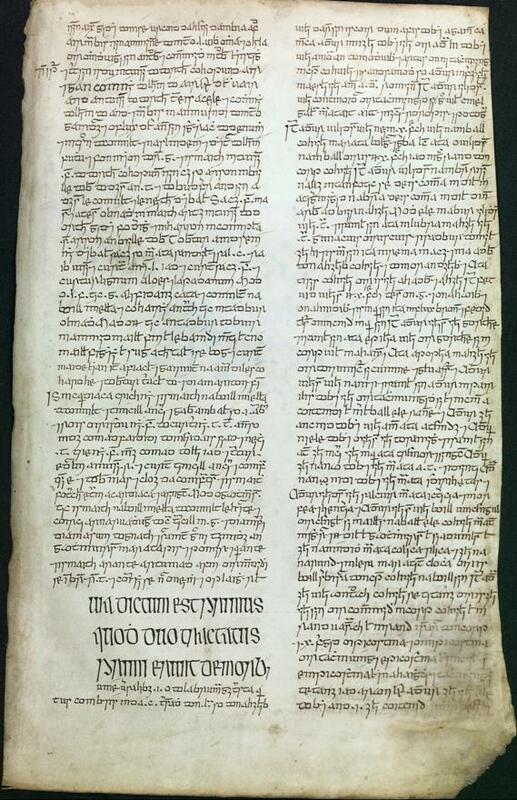 This manuscript was digitised in 2013, and is available to view on www.isos.dias.ie. 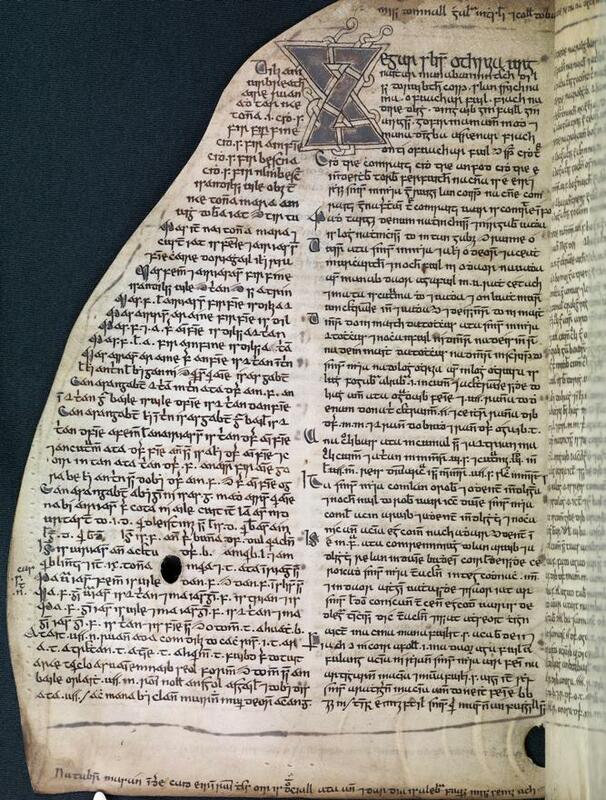 This is a composite manuscript, with 5 distinct sections, four of which comprise Gaelic legal texts. The extensive colophons and marginalia supply the names of students attending well-known law schools of the 15th and 16th centuries. Gaelic professional families who specialized in medicine produced Irish translations of important medical tracts. 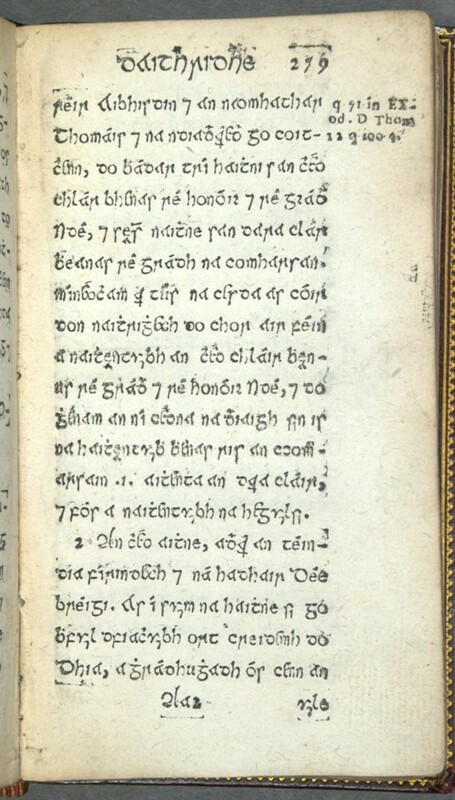 This is one of several surviving copies of an Irish translation of the major part of Book 1 of the Rosa Anglica of John of Gaddesden (Johannes Anglicus). The author was an Oxford-educated physician. The Rosa Anglica was written c. 1304-17, and first printed at Pavia, 1492. It was widely used throughout medieval Europe as well as in Ireland. The Irish translator adapted the Rosa Anglica by combining it with extracts from the Lilium medicinae of Bernard of Gordon (first published at Naples, 1480). This manuscript has recently been conserved by John Gillis, at the Delmas Conservation Bindery, 2007-10. Conservation funded by Bohringer Ingelheim Foundation. Geoffrey Keating completed his history of Ireland c. 1634. By the mid-seventeenth century, his work circulated in three languages – Irish, English and Latin – in the seventeenth century. Keating’s Foras feasa comprised a history of Ireland in two parts, the first from earliest times to the coming of Christianity, and the second from the time of St Patrick in the fifth century to the coming of the Normans in the late twelfth century. It was prefaced by a persuasive essay in defence of the honour of Ireland, in which ‘hostile’ writers including Richard Stanihurst and Edmund Spenser were criticised. Keating presented the story of Ireland in a manner that allowed the various peoples of Ireland, whether of Gaelic or Anglo Norman ancestry, to be part of a shared origin legend. He placed particular emphasis on the value of the Irish language as a repository of knowledge about the Irish past. His work was published in four volumes, with a English translation and an index, by the Irish Texts Society, 1902-14. 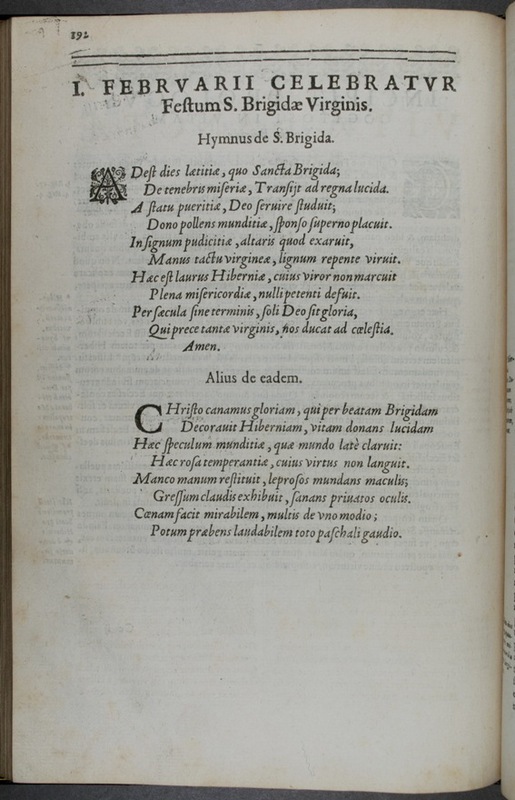 Foras feasa ar Éirinn, copied in 1666, contains references to Edmund Spenser’s views on the origins of the English language. Written in Irish (in a Franciscan friary on the Drowes River, Co. Donegal) by a Franciscan brother, Mícheál Ó Cléirigh, and three laymen, Cú Choigcríche Ó Cléirigh, Fearfeasa Ó Maoil Chonaire of Co. Roscommon, and Cú Choigcríche Ó Duibhgeannáin of Castlefore, Co. Leitrim. Two others also took part in the compilation of the Annals, Conaire Ó Cléirigh (an older brother of Mícheál) and Muiris Ó Maoil Chonaire. The scribal hands are clear and legible. These expert scribes wrote swiftly with a pointed quill. The manuscripts were written at various times between January 1632 and August 1636. 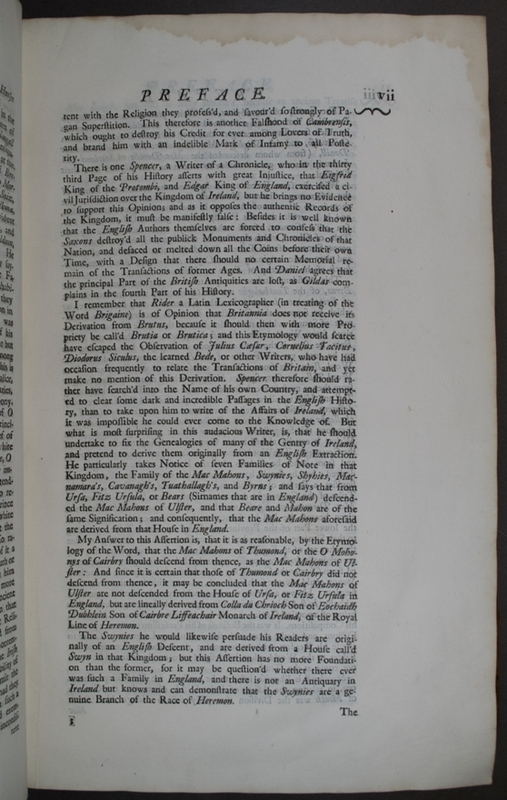 The Annals are a chronicle of Irish history from A.M. 2242 to A.D. 1616 and contain records under successive years of the deaths of kings and other prominent persons, both ecclesiastical and lay, along with accounts of battles, plagues, etc. They end with the death of Hugh O’Neill, earl of Tyrone, in 1616. The compilation was largely derived from older manuscripts, many of which have not survived, though the late sixteenth-century material also used oral sources. 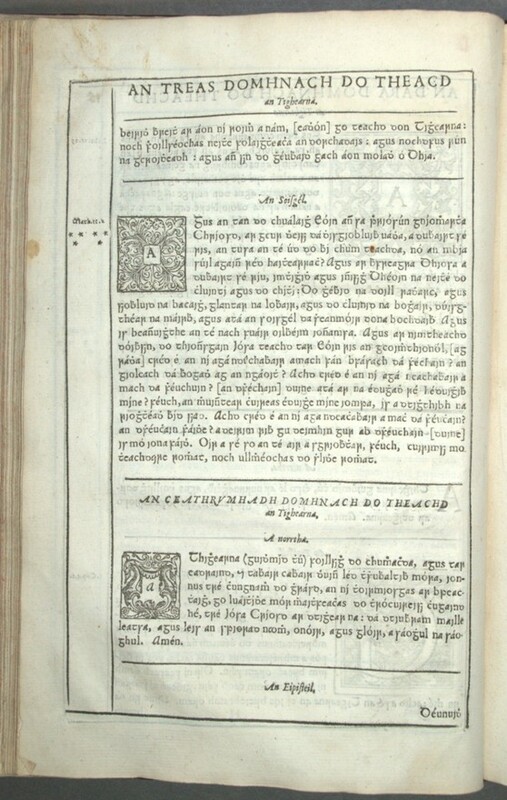 The completion of Keating’s history of Ireland in the Irish language (c. 1634) was followed immediately by its translation into English. The first English translation was produced by Michael Kearney of County Tipperary in 1635. This made Keating’s criticisms of Edmund Spenser, Meredith Hanmer, and others whose works had been published by Sir James Ware in 1633, accessible to English readers. 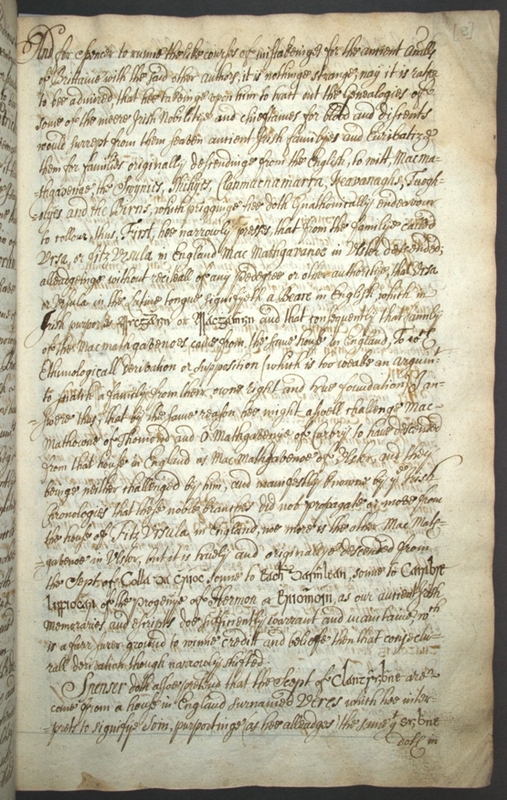 Keating cited the 1633 edition of Spenser’s View by page number, indicating that he was responding to the printed edition rather than an earlier manuscript version of Spenser’s work. A significant portion of Keating’s polemical preface was devoted to a criticism of Edmund Spenser’s writings about Ireland. 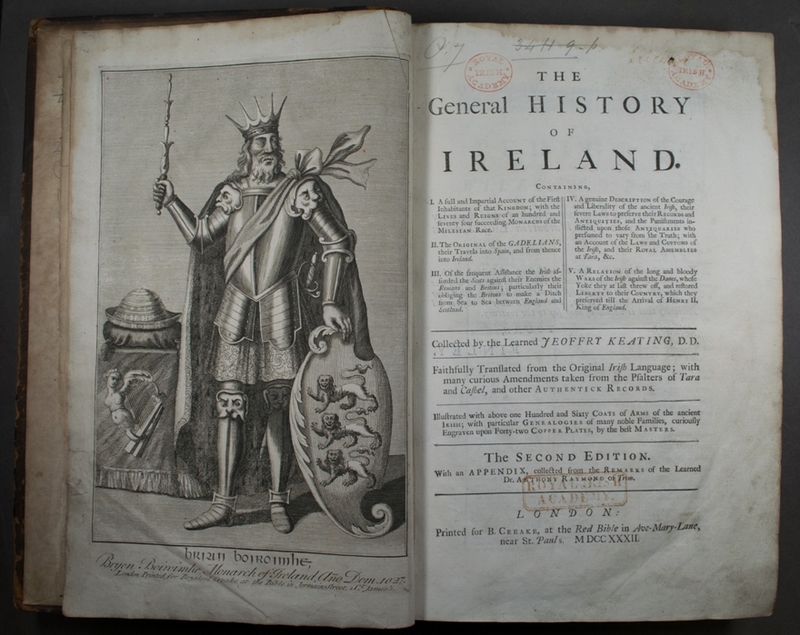 Geoffrey Keating’s history of Ireland (c. 1634) was much in demand in the early eighteenth century. Readers valued its rootedness in ‘authentic’ sources, its focus on the idea of the kingdom of Ireland, and its defence of the reputation of the Irish people. Edmund Spenser was among the foreign authors singled out for criticism by Keating. Several translators competed to be the first to publish their English language version of the history. Dermod O’Conor succeeded in producing handsome folio editions in both Dublin and London in 1723. The work quickly sold out and a second edition was issued in 1726. A reprint was published in 1732. This large compilation of bardic poetry is the work of a single seventeenth-century scribe, who is unnamed. Many of the poems relate to the early seventeenth century but the volume also includes work by earlier poets. The pages on display contain a lament on leaving Ireland by Giolla Bhridhe Ó hEodhasa (d.1614), ‘Truagh an t-amharc-sa, a Éire’ (p. 700). This is followed by another poem of exile, ‘Beannacht síar úaim go hÉirinn’ by Fearghal Óg Mac an Bhaird (d. circa 1618). Writing from exile in Scotland, Mac an Bhaird offered a politicised commentary on the Elizabethan conquest. These poets were professionally trained in bardic schools in the late sixteenth century. Fearghal Óg was principal poet to the O’Donnells of Tyrconnell and he also composed poetry for Hugh O’Neill, earl of Tyrone (d.1616). Giolla Bhride Ó hEodhasa also enjoyed the patronage of the O’Donnells and the Nugents, barons Delvin. As patronage declined, these poets pursued alternative careers abroad. Giolla Bhrighde Ó hEodhasa joined the Franciscans in 1607 and became guardian of the Irish College at Louvain. Mac an Bhaird spent time in Scotland in the 1580s and in continental Europe in the early seventeenth century. 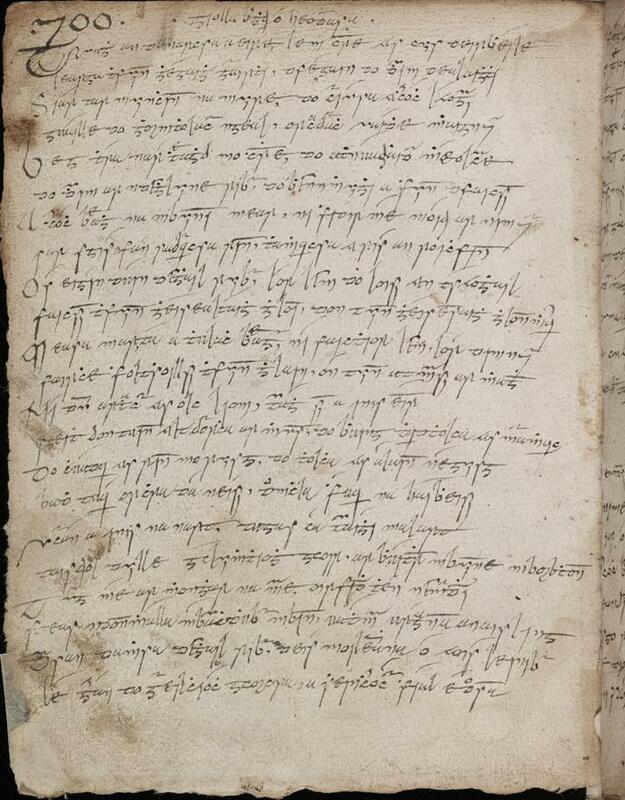 This manuscript collection of Irish court poetry was written in Lille and Brussels in the Low Countries (‘san Tír Iachtuir’, p. 213) in the years 1655-59. There are approximately 150 bardic poems in the volume, many of them composed in the sixteenth and seventeenth centuries. Prominent among them are poems by Tadhg Dall Ó hUiginn (1550-1591), a famous Sligo poet. 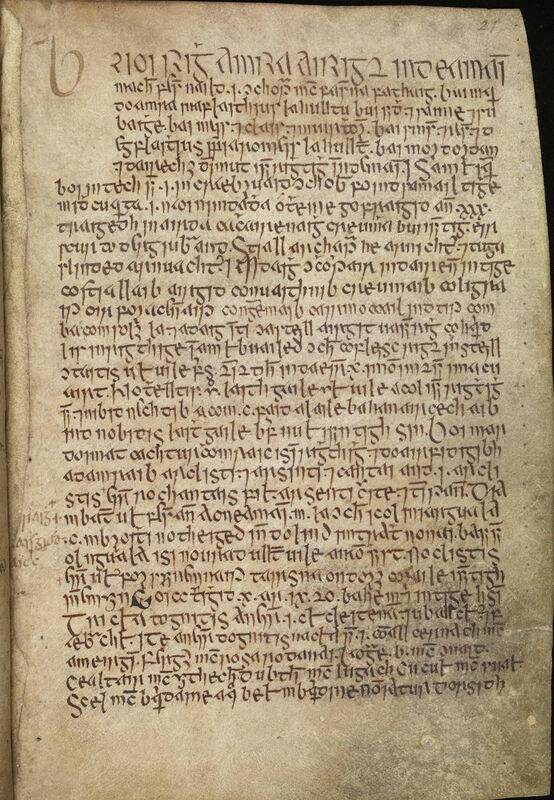 The scribe, Feargal Dubh Ó Gadhra, OSA, was known in religion as Fr Nioclás. He later returned from the continent to live in Ireland where he became prior of the Augustinian house at Banada, Co. Sligo. The manuscript is bound in leather, tooled and gilt, with gilt edges. It was bound in 1715 for Bryan Higgins, a Dublin-based lawyer who was a native of north Connacht. The manuscript was purchased by the Royal Irish Academy from James Hardiman in return for a payment of £50 and life-membership of the Academy. 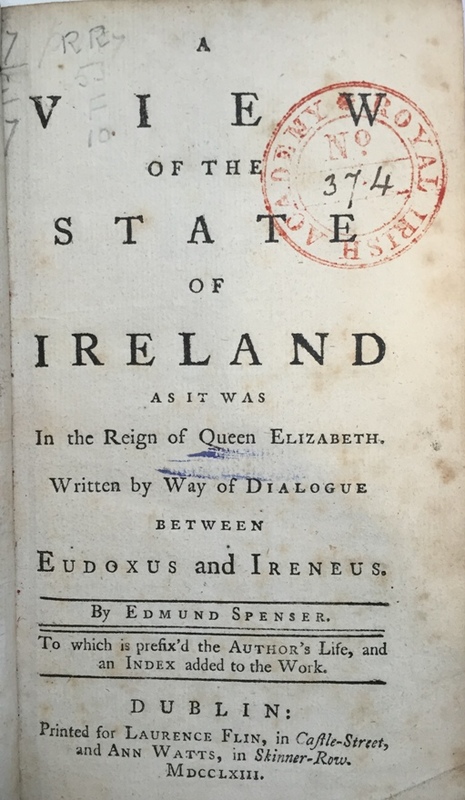 Seventeenth-century readers of Edmund Spenser’s View of the present state of Ireland could be expected to regard Gaelic literature and culture as something inferior to that of Spenser’s English world. The Irish manuscripts created by Spenser’s near contemporaries, a small selection of which are shown in this exhibition, reveal the sophistication and diversity of Gaelic culture in the early modern period. That writers such as Geoffrey Keating were keen to offer a reply to Spenser, as soon as his work was printed in 1633, is evidence of the extent to which the two language cultures were already intertwined by that date. This exhibition took place in the Summer of 2015 at the Royal Irish Academy and was organised in conjunction with the Fifth International Spenser Society Conference held in Dublin in June 2015. Osborn Bergin, Irish bardic poetry (Dublin, 1970). E. Bhreathnach and B. Cunningham (eds), Writing Irish history: the Four Masters and their world (Dublin, 2007). B. Cunningham, ‘Colonised Catholics: perceptions of honour and history in Michael Kearney’s reading of Foras feasa ar Éirinn’, in Vincent P. Carey and Ute Lotz-Heumann (eds), Taking sides? : colonial and confessional Mentalités in early modern Ireland: essays in honour of Karl S. Bottigheimer (Dublin, 2002), 150-64. B. Cunningham, The Annals of the Four Masters: history, kingship and society in the early seventeenth century (Dublin, 2010). B. Cunningham, The world of Geoffrey Keating: history, myth and religion in seventeenth-century Ireland (Dublin, 2000). A.M. Freeman (ed. 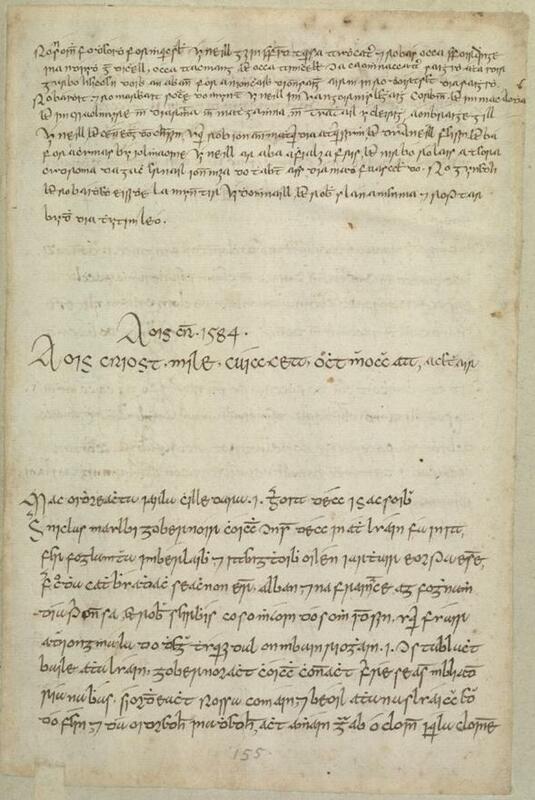 ), Annála Connacht / the Annals of Connacht, A.D. 1224-1544 (Dublin, 1944). A. Hadfield, Edmund Spenser: a life (Oxford, 2012). T. Herron, Spenser's Irish work: poetry, plantation and colonial reformation (Aldershot, 2007). G. Keating, Foras Feasa ar Éirinn: the History of Ireland, ed. David Comyn and P.S. Dinneen (Irish Texts Society) (4 vols, London, 1902-14). D. McManus and E. Ó Raghallaigh (eds), A bardic miscellany: five hundred bardic poems from manuscripts in Irish and British libraries (Dublin, 2010). J. O'Donovan (ed. ), Annála Ríoghachta Éireann, Vols 1-7 (Dublin, 2nd ed., 1856: reprinted Dublin, 1990). C. Mhág Craith (ed. ), Dán na mBráthar Mionúr (2 vols, Dublin, 1967-80). S. Ryan, ‘Windows on late medieval devotional practice: Máire Ní Mháille’s ‘Book of piety’ (1513) and the world behind the texts’ in R. Moss, C. Ó Clabaigh, and S. Ryan (eds), Art and devotion in late medieval Ireland (Dublin, 2006), 1-15. P. Walsh (ed. ), Leabhar Chlainne Suibhne: an account of the Mac Sweeney families in Ireland with pedigrees (Dublin, 1920). W. Wulff (ed. 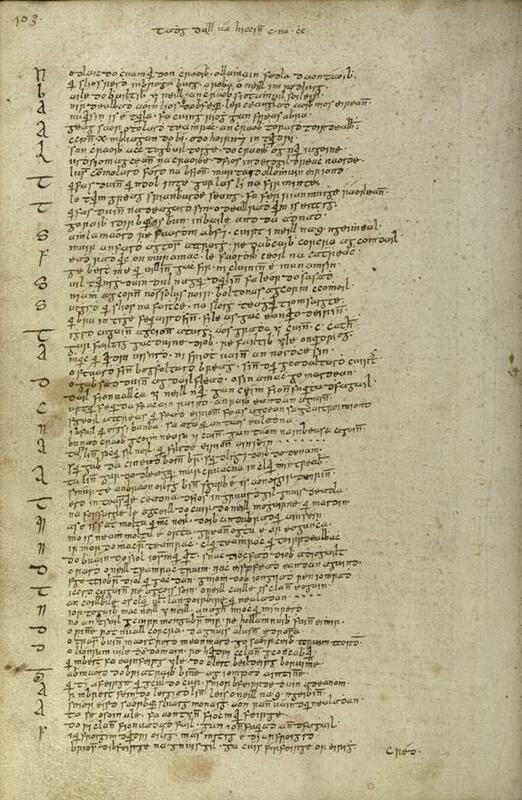 ), Rosa Anglica, sev rosa medicinae Johannis Anglici: an early modern Irish translation of a section of the medieval medical text-book of John of Gaddesden (Irish Texts Society) (London, 1929).